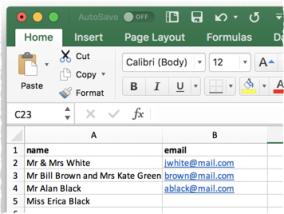 You can import guest details from spreadsheets, databases and other formats, so that you don't have to re-type them. We will illustrate this by importing some guest details from Excel. The principles are similar for other applications and file formats. Note The user interface of Excel may differ between different versions. PerfectTablePlan for Mac can't read Excel binary files, so you need to save your spreadsheet into a .csv (comma separate value) file that PerfectTablePlan can read. Select File>Save As and save it as the .csv file guests.csv (do not just rename a .xls file to a .csv file). Click Continue on any windows warning you about changing format. The data is now in a format PerfectTablePlan can read. Create a new plan by selecting File> New. Select File> Import. The Import window will appear. Ensure CSV/text file is selected and click the OK button. An Open window will appear. Navigate to the .csv file you just created and click Open. You should now see the contents of the Excel file in the Import Data window. Tell PerfectTablePlan which columns correspond to which guest properties and to ignore the first row, as shown below. Note that you can edit the data in the table before you import it. This will not affect the original .csv file. Click the Next> button (if you want to change anything you can then click <Back ). Click OK. If you are prompted to Save this import mapping to use again? click Don't save. The guests should now be imported as below. If it has imported anything incorrectly you can easily change it in Edit mode or Edit> Undo the import. The email address has been added to the guest Contact information. It has also placed guests into groups. 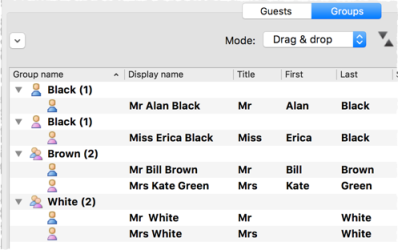 If you don't like how they have been grouped you can easily drag guests between groups in Drag and drop mode in the Groups pane. E.g. You can drag Miss Erica Black into the same group as Mr Alan Black. If you look in the Proximity pane you will see it has set proximity for the guests in each group. Note If your spreadsheet contains non-ASCII characters (e.g. Chinese or other Unicode characters) these may be lost if you save your Excel .xls file to a .csv file. To avoid this problem save as Unicode text (*.txt) and import using Custom format and a TAB delimiter. 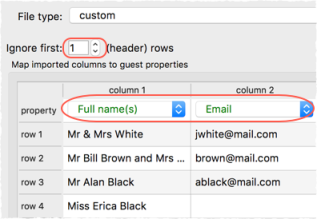 PerfectTablePlan can import complex guest lists with multiple guests per row in one multiple columns, including addresses, meal choice, VIP status, RSVP status etc. . See example import formats for more details. 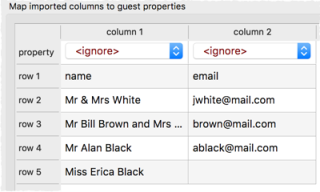 You can also import guest name data using the simpler (but less flexible) Quick Add Guests window. 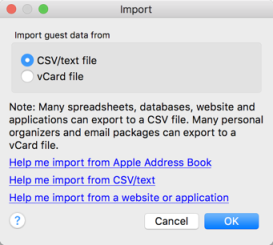 You can also import guests from any application that supports vCard format. This includes many email and address book applications. Just drag the guest vCard(s) onto the PerfectTablePlan Guests pane.